It is not just dinosaurs that have become extinct. In the last 350 years alone, almost 400 species have disappeared. For various numbers, the total of '400 species' is probably severely underestimated, but that's not what I want to focus on. Instead, I want to look at the number itself. 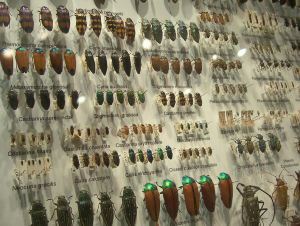 If there is one thing that most people fail to grasp about biodiversity, it would be that there's just so much of it. It's an understandable failing: I work with biodiversity on a daily basis, and even I find myself constantly startled and awed by this point. So huge are the numbers involved that it's almost counter-productive to simply report them. Humans seem to have a tendency to effectively just lump any number over a hundred or so as simply 'a lot'. 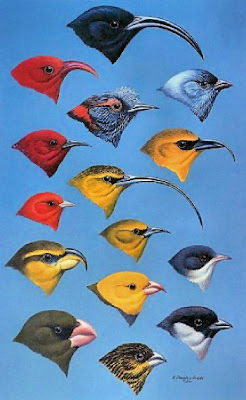 Imagine you were an avid twitcher (one with an enthusiasm for seeing new bird species) who, through a preternatural combination of flawless logistics, limitless funding and exceptional luck, was able to observe one new bird every day. At that rate, how long would it take you see every species of bird in the world? Wikipedia gives a figure of about 10,000 species of bird, which would mean that you would need 27 years, four months and 25 days. If you started at the age of 18, you would not finish until after your 45th birthday. If you moved on to mammals, you would need another fifteen and a half years. Lizards would account for another ten years; snakes another eight. Turtles you would be able to get through in just under a year, but then frogs would require thirteen and a half. Fish, on the other hand, would require the investment of some seventy years. Or, to sum up, observing every known living species of vertebrate at the rate of one a day would require nearly twice as much time as most of us are allotted in a single lifespan. Outside vertebrates, the numbers just keep adding up. Earthworms may not seem like a hugely diverse group, but would still require an investment of more than sixteen years. You'd need more than 126 years to get through the staphylinid beetles alone. Perhaps plants are more your thing? You'd better have dedication, then: it's going to take you nearly 700 years if you want to see every variety of flower in the world. After that, the mere 33 years required to deal with the ferns will just go by in a flash. No-one has yet tallied up exactly how many species of organism have been described to date, but using a conservative (very conservative) estimate of 1.5 million, observing every one at the rate of one species a day would take you more than 4100 years. Or 45 somewhat generous life spans (assuming, of course, that you were able to get things started from the day of your birth). Compared to this, 400 species is but a drop. It was no accident that the concept of evolution achieved its majority in the nineteenth century. Naturalists at that time were required more and more to come to terms with just how diverse the world's organisms were, and how inadequate the popular explanations were in accounting for such diversity. What is one supposed to make of a god who would apparently bless to the world with over a thousand species of tapeworm? 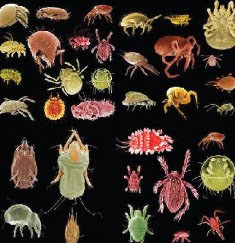 Or over 100 species of scabies mite? Unless, of course, we should simply take it as evidence that God has an inordinate fondness for scabies. I'm not sure, but there is a mistake in the paragraph under the picture with birds. but previously in the same paragraph you were talking of a rate one every day? Yes creationism is a bit boring it's true (except as a sociological disorder in which case it's pretty fascinating). But indulge me with one of my favorite counter-creationist arguments, since your last sentence circles back to the first: why would a benevolent creator invent so many species of parasites and disease bearing organisms designed to torment, destroy and consume his other creations in gratuitously complex, inventive and sometimes disgusting ways...? You don't have to answer that btw. Thank you, Arek, for spotting the error. I've corrected it now. Reprobus: the Fall, supposedly. But, of course, the Fall could only ever work as an explanation for those parasites, etc. that affect humans, not for those to which human existence is generally indifferent. Which connects to another major reason why such high diversity is problematic for standard creationism: from the perspective of human utility, the far greater part of it is simply irrelevant. Are they saying their were less than 400 species of dinosaur? Am I missing something or are they partially insane? Depends on if you mean the leaders or the followers. I would say that the first are generally con men. They lie through their teeth because it is allowed to further a religion and/or appropriate for themselves. The latter are generally ignorant or otherwise in denialist mode. They are either unable to see the insanity or able to deny it. Yes, William, you missed the phrase "In the last 350 years alone,". They're saying that a further 400 (non-dinosaur) species have gone extinct in the last few centuries, the implied argument being that such a 'high' level of extinction makes that of the dinosaurs (and the plesiosaurs, mosasaurs, trilobites, gelocids, trilobozoans, trimerophytes, ammonites, goniatites, loxonematoids,....) more credible.